KABUL, Afghanistan -- In a dank, malodorous building at the Soviet-built sports complex in central Kabul, five young Afghan men in bikini bottoms grimaced and flexed their triceps on an octagonal stage in front of a couple hundred onlookers. "Let's change the music," said a voice on a loudspeaker, and the crowd cheered as dance music started blasting from the speakers. The steely-faced competitors finally grinned, and shifted their poses. 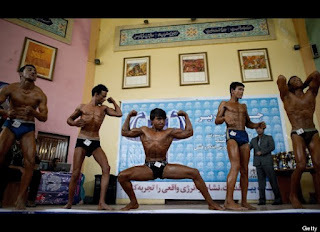 This was the Mr. Afghanistan bodybuilding contest -- Kabul City (East) regionals. The games were no small event: Four hundred and twenty challengers had shown up for this round alone; a lucky 27 of them would progress to the national competition in mid-May. "I was so small when I was a kid, so I always dreamed of being fit and strong," said a 23-year-old competitor named Namgialay, as he stood proudly with his first-place trophy for the 55-kilogram division. "I love doing this, it's my favorite sport. I've won this competition four of the last five years, but I'm still not ready for the international games yet. Maybe next year." 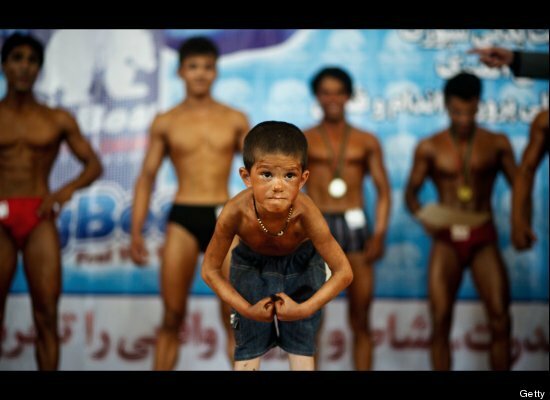 Bodybuilding has a long, prominent place in modern Afghan history. During the Soviet times, when international heroes like Arnold Swarzeneggar defined corporal prowess, weightlifting was one activity Afghans could use to defiantly challenge their Russian occupiers. The activity did not come to a halt during the culturally dark 1990s, when the Taliban ruled Afghanistan. The events were just smaller, less jovial, and all the men were required to wear long pants. "The Taliban used to come and laugh at us when we struck our poses," said Khyal Ahmad, a 28-year-old member of the national team who had come to watch, and even through a layer of clothing was obviously one of the strongest people at the gym. 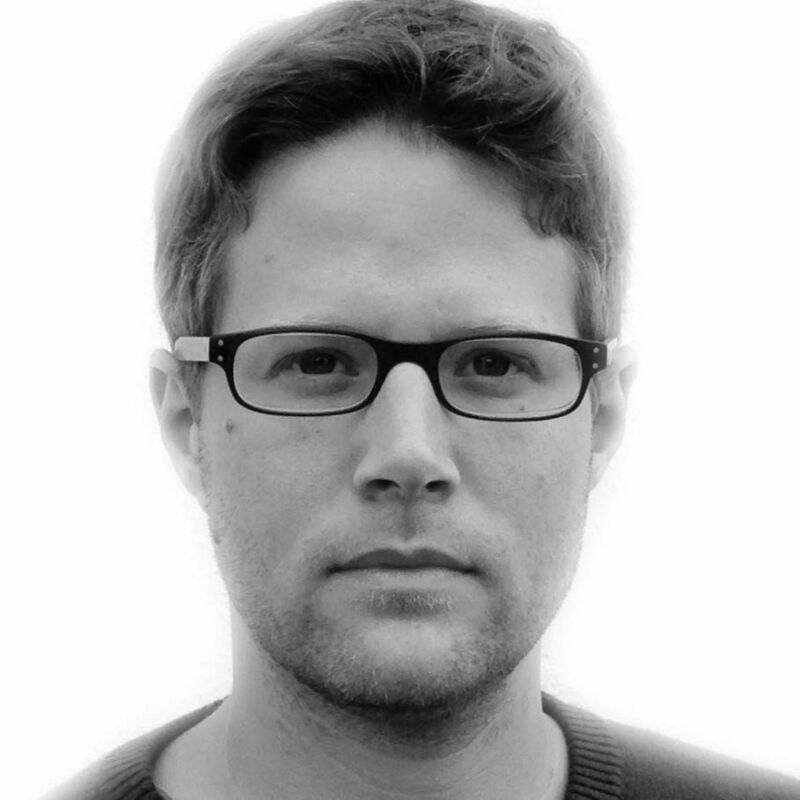 "After the Taliban left," he said, "the pants came off." "Now we have more than 170 clubs in Kabul," said Khwaja Mohammad Fardin Abassi, the vice president of the body building federation, as he flexed a bicep through his blue tweed suit to punctuate the point. Off to the side of the tent, a scrawny 16-year-old boy stood with some friends, staring at the muscular men around him. "Aren't they so strong?" the boy, Habibullah Noori, marveled. "One day I want to be a champion, too. Everybody thinks Afghanistan is not strong, and not good at sports. I want to show the world." Not everyone's ambitions were so high-minded. 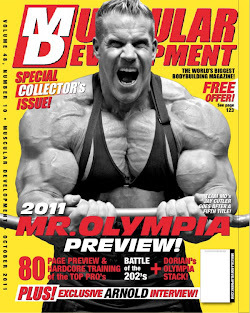 "I truly believe the fundamentals of all sports is bodybuilding," Abassi said. "We've worked very hard at the federation to encourage young people to go to the gym: he can stay out of trouble, he'll be healthy, and he will always look good, and he will get a nice girlfriend. Even when he's wearing a shirt, he will impress the girls."